New Delhi: Leader of Congress in the BJP-led NDMC Mukesh Goel today alleged that the condition of the civic body-run Hindu Rao Hospital was “deteriorating” and asked authorities to take up the repair of the old municipal hospital. In a statement, the senior Congress leader claimed that a nurse was injured after a portion of the ceiling in parts of the hospital had collapsed. “In last two weeks, three such incidents have occurred, so, I appeal to the municipal commissioner that a proper survey be done of the building and damaged parts be identified and repaired,” he said. 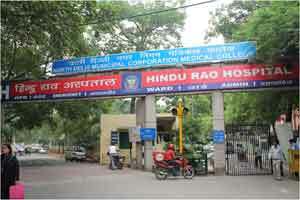 The Hindu Rao Hospital is one of the oldest and biggest hospitals in Delhi and fall under the jurisdiction of the North Delhi Municipal Corporation. It is NDMCs oldest hospital where a large number of poor patients come for treatment.